I am currently writing this post lying down in bed. 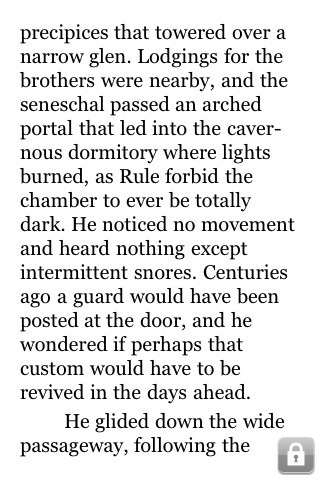 As I usually do each night, I'm reading a book from the Amazon Kindle app on my iPhone. One thing that many iPhone users will agree on is the annoying way the accelerometer works when you're lying down. For instance if you lie on your side, it's impossible to keep Safari in portrait mode. The Kindle app made a super simple and elegant feature to solve this, the lock icon. If you click it, it locks the app into whatever mode you're currently on. Click it again to unlock and the accelerometer behaves as usual. The thing I like is that the icon disappears after a couple of seconds so you're never bothered with a persistent button. I hope Apple decides to incorporate this into their native apps like Mail and Safari.